Multichannel News is a B2B brand intended for individuals with broad-based interest in the cable television and telecommunications industries. Guitar Player is a monthly publication for guitarists and people interested in guitar music. Plant Services is a media franchise that reaches multilevel MRO (maintain, repair, replace, retrofit, overhaul and operations) and End User buying influencers throughout the U.S. and international manufacturing segments. Echo Publishing began in 1972 with a local ownership group as Echo Publishing featuring the Country Echo weekly newspaper based in Pequot Lakes. Founded before the turn of the century, The Echo Press is the only in-depth news source in Douglas County, which also publishes a total market coverage shopper. Based in Cloquet, the Pine Journal publishes every Thursday and reaches approximately 3,600 readers each week, including newsstand sales. The magazine industry is fighting back against the spread of fake news. Some 123 magazine brands from 30 of MPA – The Association of Magazine Media's member companies have joined forces to launch an advertising campaign to assure both marketers and consumers of the trust and brand safety of magazine media. The goal is to bring attention to the credibility of magazine content – how it is thoroughly researched, fact-checked, curated and produced. It will be the largest campaign of its sort for the magazine media industry in terms of the number of titles participating, the reach of Americans and the dollar value. The campaign, which is called "Magazine Media. Better. Believe It." is estimated to reach 75% of U.S. adults. Though MPA says it won't know the full dollar equivalent until the campaign has finished its run, from this month through March 2018 in both print and digital properties, the campaign has already surpassed $20 million in advertising. "In a media world where three out of four Americans say they have fallen for fake headlines, and marketers as well as consumers are challenging the legitimacy of many media outlets, we believe it is imperative to remind our customers about the tremendous resources the industry puts behind our content platforms," stated Linda Thomas Brooks, president and CEO of MPA – The Association of Magazine Media. 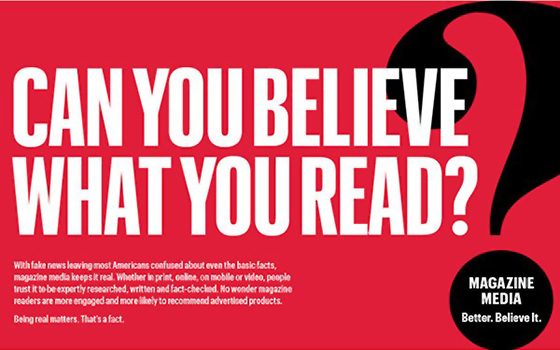 The ad campaign poses eight attention-grabbing questions – such as "Can you believe what you read?" and "Been fooled by fake content?" – followed by a blurb on why magazine media is trustworthy and reliable. "In an age of confusion, it is important to convey the power and professionalism of magazine media, driving home the fact that our industry provides news and information that both consumers and marketers can trust," stated Michael Clinton, President and Marketing and Publishing Director of Hearst Magazines. While MPA is spearheading the campaign, it is an industry-wide effort. There are no MPA logos on the ads. The companies participating in the advertising campaign include America Media, American Media, AMG Parade, Active Interest Media, AFAR Media, Bonnier, Condé Nast, The Economist Group, Forbes Media, Garden & Gun, Harper's, Hearst Magazines, HistoryNet, Hollywood Reporter-Billboard Media Group, Ink Global, Mariah Media, Meredith Corp., The Nation, National Geographic, New York Media, Ogden Publications, Pride Media, Rodale, Smithsonian Media, TEN: The Enthusiast Network, This Old House Ventures, Time Inc., Today Media, Trusted Media Brands and Weight Watchers. Meredith, for example, has 16 brands participating, including Better Homes & Gardens, EatingWell, Family Circle, Martha Stewart Living, Midwest Living, Parents, Rachael Ray Every Day, SHAPE and Traditional Home. In a LinkedIn post titled "All Content Is Not Created Equal," Thomas Brooks wrote, "Magazine media content faces intense scrutiny and, in large part, that is the secret sauce of these brands. By imposing extreme rigor, discipline and standards upon content creation, magazine brands do a better job of putting information in context and deliver a level of superior quality that readers have come to expect and trust in their everyday lives." The message of the campaign could not come at a more crucial period in American media. The horrific mass shooting in Las Vegas on Sunday night unleashed a torrent of fake news stories, which spread like wildfire on social media. In some cases, they were even briefly picked up by mainstream media. Patch, the hyperlocal news publisher that spun out of AOL in 2014, is gaining traction and building a loyal audience base. It uses a combination of community news and conventional subscription models, as well as integrating with diverse news feeds and aggregators. The turnaround, which has largely been grassroots and under the radar, may come as a surprise to people on Madison Avenue, concedes CEO Warren St. John. He describes one such recent encounter in which an executive said, "I didn't know Patch was still around." "That's happening less and less," St. John says, as the company begins shifting from turnaround mode to a promotional one, though it still is largely word-of-mouth. In a briefing with Publishers Daily, St. John cited some significant publishing thresholds, including an audience of 27.5 million unique monthly users, a year-over-year gain of 25%. Importantly, he says the growth has been completely organic. "We don't buy traffic," he explains, asserting the gains are coming from the local community content it publishes. He says Patch has more than doubled its editorial team to 110 full-time employees and a few dozen freelancers and contractors. Many of the additions are seasoned news community journalists cast off from the implosion of daily and community newspapers that have gone under or cut back in recent years. As important as news content has been in the turnaround, St. John takes equal pride in Patch's reinvigorated engineering team, which has rebooted almost every facet of its platform, including its internal content management system. It has also revamped how it distributes and syndicates its content to other platforms and news feeds, as well as emerging platforms, such as Alexa, Amazon's voice-activated AI device. Patch also relaunched its front-end web publishing experience and a new iOS version of its app and is poised to launch its first Android app. St. John says the company is just beginning to make more noise on Madison Avenue and with major national brand advertisers. It recently named Matthew Schulte, former Wenner Media Executive Director of Digital Sales, as its Senior Vice President of Sales. 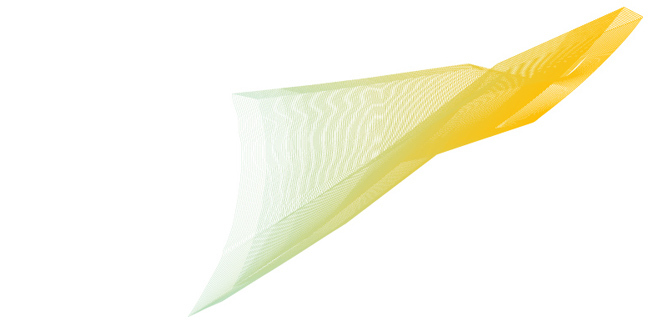 "Until now, we didn't feel confident that we had a product we could go out and sell to brands. I think we're at that point now," he says. An approval copy of the Audit Report is sent to the clients upon the completion of the audit. Please be sure to review the report carefully. If there are any questions or corrections, please let Verified know as soon as possible. Publishers have 10 days to review an approval copy of the report. If additional time is needed, please let Verified know. Once the report has been approved, please sign, date and fax or email back the first page of the report to Verified. It's important for the report to be approved by the publisher before the final draft of is issued. If there are changes after the report has been issued, there may be an additional charge for any corrections. Publishers cannot distribute or use any part of the report before the final report has been issued by Verified. If you have further questions regarding report approvals, please call Verified at 415-461-6006.